Fact: I love beer. It's my go-to drink at just about every outing, from sports games to concerts to birthday parties. My tastes have changed since I first started drinking the stuff in college, though. I now enjoy sipping flavorful craft beers in quiet bars rather than downing light beers during games of beer pong. Beyond being a delicious beverage to enjoy while out, I've heard that beer, when applied to your hair, can have some serious benefits. I decided to do some research on the matter and learned it's actually true: Beer is good for your hair. 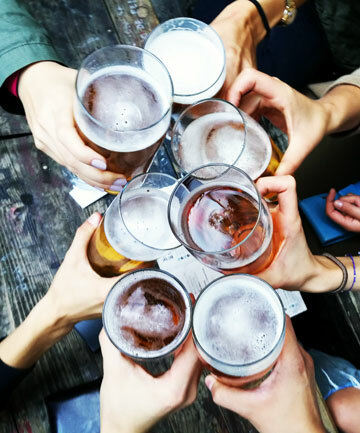 "The proteins found in beer are similar to the proteins found in hair," explains Burton Machen, stylist at the Sharon Dorram Color at Sally Hershberger Salon in New York City. "It helps to smooth out the hair and adds shine by penetrating into the shaft of the hair and smoothing out to cuticle." It makes sense, then, that there are a bunch of beer shampoos on the market now. Would beer make my particular hair (which is dry and coarse) look better, though? That's what I really wanted to know. Keep reading to see what happened when I washed my hair with beer shampoos and did a beer rinse.